What's in a name? At Johns Hopkins, a formal Department of Neuroscience was founded 25 years ago, but the institution's contributions to understanding and studying the brain started three-quarters of a century before that, in 1906. The long history of brain sciences at Johns Hopkins and the many contributions of the institution's researchers are outlined in the Oct. 20 issue of Neuron by the first and only director the Hopkins department has ever had. Solomon Snyder took the reins of the fledgling department on July 1, 1980. 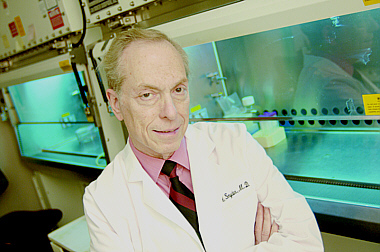 "There were enclaves of scientists and physicians studying the brain in various departments at Hopkins well before 1980," recalls Snyder, who came to Hopkins in 1965 for his clinical residency in psychiatry and never left. "But creating the department allowed people studying the brain in one way — by studying what brain cells do, for instance — to work in close proximity and share their knowledge with those using different techniques and approaches. Together with the three brain-centered clinical departments, Hopkins has an exceptionally robust environment in which to study the brain." Snyder, Distinguished Service Professor of Neuroscience, Pharmacology and Psychiatry, will be among those honored Nov. 11 at a gala dinner at the Renaissance Hotel in Baltimore and at the symposium Discovery and Hope: A Celebration of Brain Science at Johns Hopkins earlier that day. Snyder is expected to step down as department director sometime this year while remaining a full-time faculty member and head of his thriving research laboratory. Two Nobel laureates, Richard Axel and Eric Kandel, and six others — Cori Bargmann, Roger Nicoll, Carla Shatz, William T. Newsome III, Fred Gage and Huda Zoghbi — have confirmed their participation in the symposium. Johns Hopkins neuroscientists Rick Huganir and Snyder will provide opening and closing remarks, respectively. On the previous day, Nov. 10, the Department of Neurology will hold a symposium featuring Hopkins scientists and neurologists in honor of its upcoming 35th anniversary. The first formal brain studies at Johns Hopkins started in 1906, when Harvey Cushing became the first director of Neurosurgery. His research established that hormones secreted from the brain's pituitary gland promote growth. Walter Dandy, who succeeded Cushing, figured out in 1918 that air could be used to enable X-rays of the brain. His technique remained the best way to see into the skull to identify brain tumors and other problems until the invention of computer aided tomography, or CAT, in 1972. Around the same time as Dandy's work, the first director of the Department of Psychiatry, Adolph Meyer, was instituting an unprecedented science-based approach to the field. He established laboratories of neuroanatomy, neurophysiology and a new field he dubbed "psychobiology." One of the early members of the Psychiatry Department was Curt Richter, who developed a precise means to measure aspects of a rat's life and used the system to determine the molecular and anatomical regulation of the "biological clock," the minimal daily requirement for vitamins and minerals, and the scientific basis for the lie detector test. W. Horsley Gantt, a member of the department at the same time, was a major figure in introducing Pavlovian psychiatry to the United States and used Pavlov's technique to establish models of mental illness in dogs. In 1933, Phillip Bard came to Hopkins to be the fourth director of the Department of Physiology and to carry out research to identify the region of the brain that caused "sham rage" in cats. His work showed that this behavior could be caused by stimulating the posterior hypothalamus, a finding that helped create the idea that the hypothalamus and limbic system in the brain are responsible for emotions. In the late 1930s, Bard helped recruit Chicago's Ralph Gerard to Hopkins because the latter had developed and used techniques to measure the electrical output of the brain. While at Hopkins, Gerard refined the techniques and used them to map areas of the brain responsible for detecting the sensation of touch. Vernon Mountcastle, who succeeded Bard in 1964 as director of Physiology, in the late 1950s added to Gerard's earlier findings by using microelectrodes to more finely map excitation in the brain, which revealed the brain's "columnar" organization, now known to be a universal organizing principle of the brain. Since those early years when the brain's "big picture" was still a blank canvas, research in the brain sciences at Hopkins has expanded to investigate questions both big and small. For example, researchers in the Zanvyl Krieger Mind/Brain Institute on the Homewood campus are studying recognition, sensation and other "big" capabilities, while some on the East Baltimore campus are measuring electrical signals from individual neurons in a laboratory dish to study how they react to different stimulation. Four major areas of investigation occupy the time of brain scientists at Hopkins: cellular and molecular neuroscience; systems, cognitive and computational neuroscience; developmental neuroscience; and neurobiology of disease. Scientists working in the first area are looking into what roles different types of cells play in the brain, what genes and proteins allow brain cells of various descriptions — neurons, astrocytes and glia — to do what they do, and what molecules are involved in the cells' communications with one another. Snyder, for instance, uncovered in the early 1970s the natural docking place for opiates on brain cells and more recently identified key roles for two gases — nitric oxide and carbon monoxide — as messengers that help brain cells communicate. Some of those studying systems, cognitive and computational neuroscience are using engineering and computer science to model certain capabilities of the brain, like the processes that allow us to reach for and touch a target, and others are interested in answering some of the most fundamental, long-standing questions of the brain. Huganir and his colleagues, through their efforts to understand the big question of how learning and memory occur, have actually created a forgetful mouse. Scientists working in the area dubbed developmental neuroscience might study the protein and molecular cues that control and direct nerves' growth during early development in species from frogs to mice or what the cues are that tell a cell to become a nerve cell in the first place. David Ginty, Alex Kolodkin and others are identifying signals that direct nerves' initial growth, hoping that the knowledge might reveal ways to successfully regrow damaged nerves. And, of course, scientists at Hopkins studying the biological problems underlying diseases of the brain and nervous system are trying to understand what causes these diseases with the hope that their knowledge will help lead to new treatments or even prevention. These scientists are probing genetic ties to diseases like bipolar disorder and Parkinson's disease, or looking for targets that might help prevent secondary damage that occurs after stroke, or trying to unravel the complex factors that lead to cells' death in diseases like muscular dystrophies and Alzheimer's disease. Akira Sawa recently uncovered a major role for the cancer gene p53 in controlling nerve cells' death in Huntington's disease, for example. At its inception, Hopkins' Neuroscience Department was one of the first in the nation, and today it is the largest of the basic science departments at the School of Medicine, with 25 primary faculty. Another 78 Hopkins faculty have secondary or joint appointments in Neuroscience, including two dozen or so whose primary appointments are in the departments of Neurology, Neurosurgery or Psychiatry. In the Department of Neurology, there are roughly 75 primary faculty; in the Department of Neurosurgery, 24. The Department of Psychiatry, founded almost 100 years ago, boasts 139 full-time faculty members with primary appointments. At the Nov. 11 symposium, topics include the latest on our understanding of smell, vision, learning and memory, decision making and balance-eroding diseases called spino-cerebellar ataxias. The separate Nov. 10 symposium, called Looking Forward: Tomorrow's Neurology, will include scientific presentations by nine Hopkins Neurology faculty members and three outside neurologists on topics ranging from the genetics of multiple sclerosis to new treatment options being developed for multiple sclerosis, Parkinson's disease, muscular dystrophies and motor neuron diseases. The Society for Neuroscience annual meeting starts in Washington, D.C., on Saturday, Nov. 12.